Get the flaring performance that you expect! 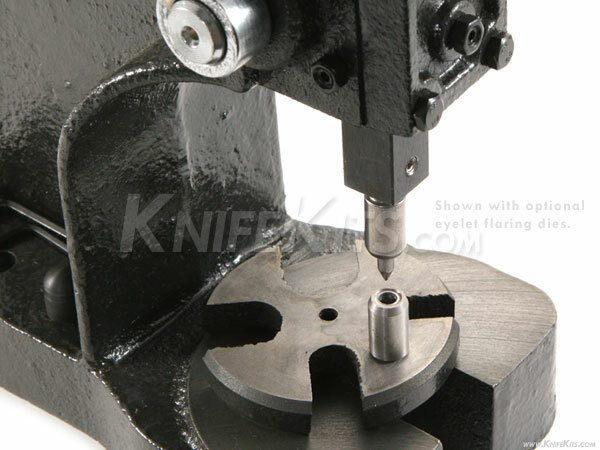 The CKK Master Series Rivet/Eyelet Flaring Press design was invented by KnifeKits.com to hold our industry standard rivet flaring dies securely while providing the controlled pressing force necessary to "roll fasten" your thermoform eyelets (commonly called, "Kydex Rivets"). Combined with our legendary flaring dies, our press model (above) is the best selling, best value and best performing KYDEX® Eyelet Flaring System of all time! We supply these tools to companies who make hundreds of sheaths and holsters, and this the design of choice for professional quality flaring results. Put a permanent end to split rivets and flattened heads when "roll fastening" rivets through your thermoform sheet (KYDEX®/HOLSTEX®/BOLTARON® or Concealex). This press (used with optional Master Series dies shown below) will help you create the perfect "flare side" on your rivet fasteners to help you add that "professional touch" to your sheath and holster work. 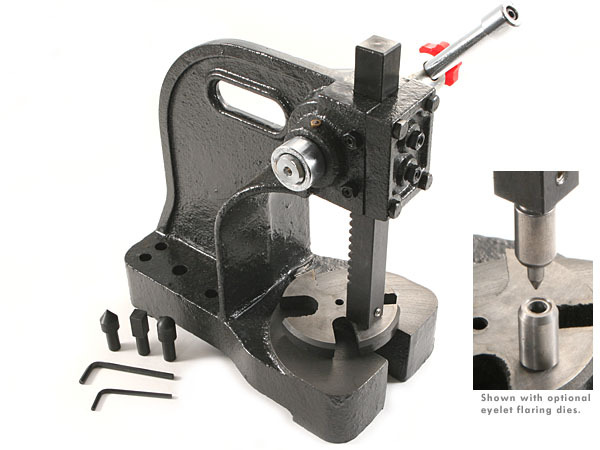 Other systems split the head of the eyelet, creating an unattractive, "amateurish" effect to the final sheath product. And they are much less secure. Flaring systems that do the proper "roll-over" to these eyelets can cost as much as $600 dollars and are very hard to find. Our CKK rivet flaring press (and available 3/16" and 1/4" Master Series dies) are professional grade tools and will finish the rivets on your sheaths with a presentation grade finish. Our Master Series press also comes with (2) Allen wrenches for making press adjustments and securing set screw in tool holder. 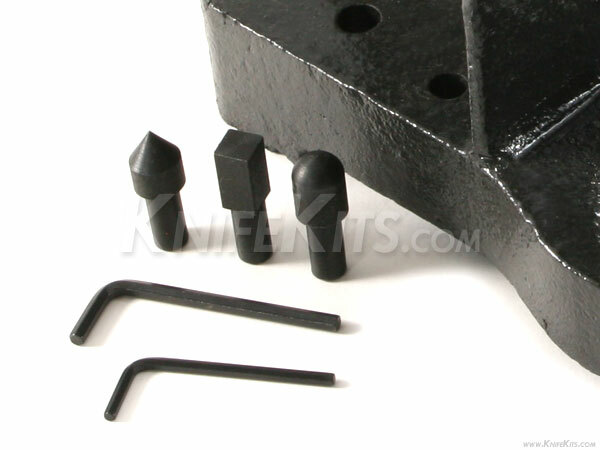 It also comes with a 3-piece hardened ram set that will assist with pin flaring and other shop chores (see image). 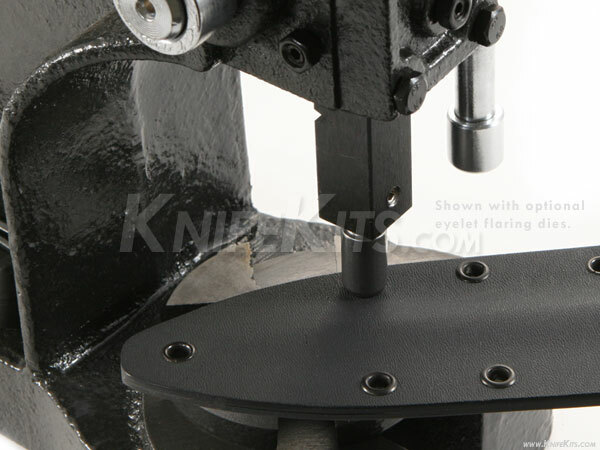 * Please note that the bottom plate on our rivet flaring press is a free-floating design. No roll pin will be provided for the bottom die plate, as the design requires self-alignment for proper eyelet flaring.